Learn How To Read A Wine Label In Just A Few Minutes. 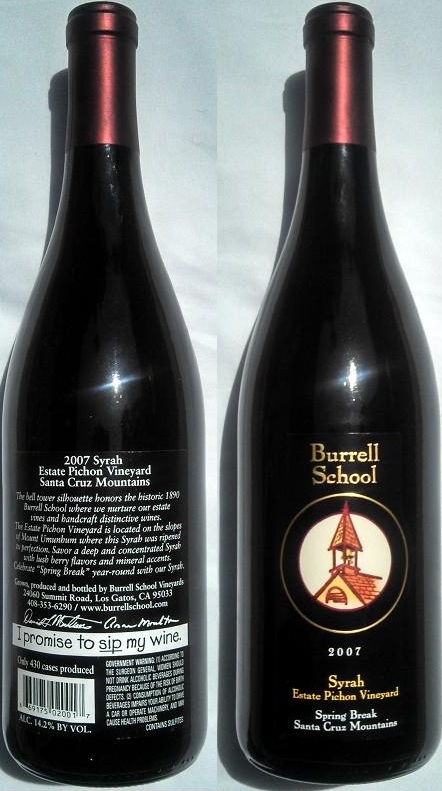 Reading Wine Labels (Part 1): What Are Wineries Required to Print on Wine Labels? Wine Bottle Labels. How Many items Listed Below Can You Find? How do you read a wine label? What are the real facts about the wine and what’s just marketing glitz? Is there any way to ensure that a wine is good from the label on the bottle? These are the most common questions asked by wine novices. If you don’t have access to the wine maker or at least a web site that describes the wine, the wine bottle label is probably the only thing left, so you need to know what’s important and what’s just a distraction. We’ve listed a number of terms that usually appear on a wine bottle label and for those of you with attention spans that are measured in milliseconds, we’ve ordered them from most commonly asked to least commonly asked. Most of the terms below are either required by law or virtually demanded by the consumer who wants to know what is inside a bottle. The name on a wine label is usually the name of the Winery that makes the wine, but it can also be a brand name of a wine produced by a larger winery. For instance, Bronco Wine Company owns over 50 wine labels, perhaps the most famous of which is Charles Shaw Wines, otherwise known as “Two Buck Chuck”. Despite its notoriety however, Charles Shaw is not actually a winery at all but just a label for a recipe of wine produced by Bronco Wines. According to the TTB (the branch of the US government that regulates alcohol sales, the ever so creatively named Alcohol and Tobacco Tax and Trade Bureau), brand names must be clear and not misleading about the age, identity, origin or other characteristics of the wine. This really must mess with the creative marketers who rarely let something as trivial as fact stand in their way of a great story. Most wines produced and sold in supermarkets are Varietals meaning they have primarily one type of wine grape in them. In order to have the wine label call out a Varietal name as the type of wine, it must contain at least 75% of that grape. Other grapes can be used to enhance the flavor. In Europe and particularly in France, the region from where the wine comes is more important than the Varietal or Varietals from which it is made. Therefore regions like Bordeaux or Burgundy will often be named in the wine label instead of a Varietal like Merlot or Pinot Noir. If the wine label does not designate a Varietal, other terms can be used such as White Wine, Red Wine, Table Wine, Rose Wine. Table wines in particular connote bad quality wines but there are many wine makers that venture outside the norm when creating blends so that every characteristic of the grapes are balanced to achieve a great flavor. Many wineries create wine blends using the same Varietals as the Classic Bordeaux blends that are designated as Red Table Wines but are exceptional. The Vintage Date on a wine label indicates what year the grapes were harvested, not when the wine was bottled which is a common misconception, but from here, things start to get a little more complex. Are you ready? A Vintage Date can only be shown on a label if a growing area, in the US, usually a state or AVA is also shown. If the designation is a State, then 85% of the wine must be from that year and State. If an AVA is used, 95% of the grapes must be from that year and from the designated AVA. So that begs another question. What is an AVA? Many people call them Appellations but the correct term in the US is AVA, which stands for American Viticultural Area. We have a write-up on it on our main site. If there is no Vintage date printed on the wine label, then the wine probably contains grapes harvested in different years or AVAs so that they no longer can claim a specific year as the vintage. By the way…have you every heard a “know-it-all” proclaim…”Ah…19XX, that was a great year?” Don’t read too much into the Vintage Date on a label unless you know a few other facts about the wine. A great year in the US might have been miserable in France. Even areas within a state can experience widely varying conditions. Napa might have a great year because rainfall and sun were perfectly in balance while Santa Barbara might be miserable because there was a drought or cooler weather. This is where the grapes were grown. It can be a wine related region like an AVA or could be a political boundary such as a County, State or Country. If a political region of origin is called out (a County or State usually), then 75% of the wine must have come from that region. If an AVA is called out, then 85% of the grapes must have originated in that area designated on the wine label. This information is required to be printed on the wine label of all wine sold in the US. Two qualifiers can be used as well. If the term “Produced” is used in conjunction with the address; it means that at least 75% was fermented at that address. If the term “Vinted” is used, it means that 75% of the wine was cellared at the address. The wine label must clearly indicate how much wine is in the container (and please let the container be a bottle, not a box – if you are buying boxed wine, just quit reading now). There may be a time when good wines are produced in boxes but for now, the terms “good wine” and “box” have about as much in common as the words “honesty” and “politician”. The alcohol content must be printed on the label of the wine. It is usually expressed as a percent by volume and unlike what virtually every college student would like to believe, more alcohol does not mean better: quite the contrary in most cases. French wines tend to run 1% to 2% less alcohol then US wines. If the Alcohol content of a wine is getting above 14.5%, the wine is often called “hot” and the concern is that the alcohol can overwhelm the other flavors in the wine. The grapes from most US wineries are riper than their European counterparts, which usually leads to a higher alcohol level in the wine. The one exception to the alcohol by volume declaration is when the wine is labeled as Table Wine or Light Wine. If these terms are used on a wine label instead of a Varietal declaration and the alcohol content is between 7% and 14%, the exact alcohol level is not required to be printed on the label. Virtually every wine contains sulfites so the wine label must call out sulfites as a content if the wine may be sold in any interstate commerce. FYI for those of you who feel that sulfites cause headaches, we have a post on this subject. Sulfites are rarely the cause of wine headaches. …and last but not least, the cleverly worded and endlessly entertaining warning mandated by the US Government on any alcoholic beverage label that is greater than .5% by volume. That’s the list of what is required to be listed on a wine label. However, when the marketers get turned loose on the labels, things can get “interesting”. Part two of our wine label posts dives into the other terms often found on wine labels, sometimes informative and sometimes confusing.